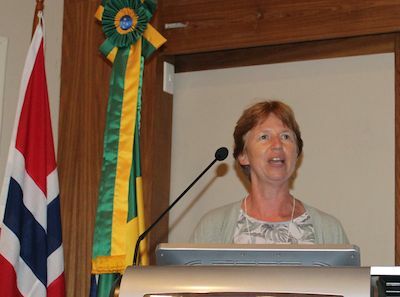 For the 6th time Norwegian and Brazilian researchers and academics were gathered for the annual November Conference in Rio de Janeiro. The November Conference aims to bring together key players from both countries, with a common goal, which is state of the art research. 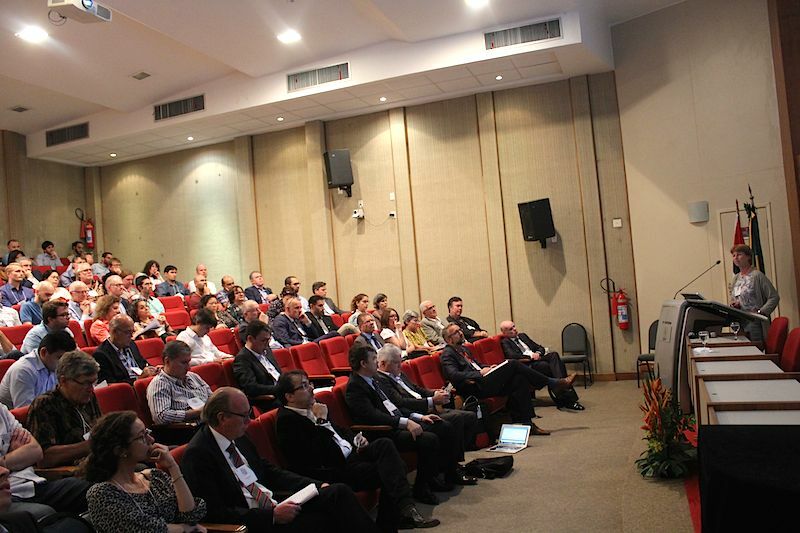 This year´s conference took place in the Brazilian center for physics studies (CBPF) in Urca on November 12 and 13, 2018, and was opened by Mr. Ronald Shellard, CBPF director, by Maurício Syrio, superintendent at Finep and by Sissel Hodne Steen, Norway´s Consul General in Rio de Janeiro. 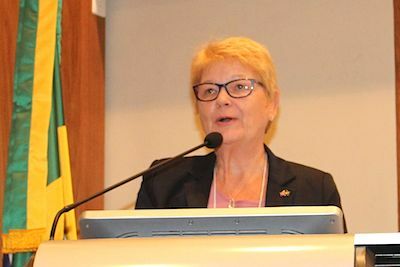 Consul General Sissel Hodne Steen. «Through turbulent years the November Conference has kept a steady course, and the organizers have not lost sight of the vision to create a dialogue between academia in Norway and Brazil regarding technology in the oil, gas and energy sector, as well as between industry and academia, a longstanding tradition in Norway. The conference has proven its relevance for six years now, and will this year be addressing relevant issues like cost reduction, the need for safer and more efficient operations and the need for considerable reduction of emissions. Research collaboration is highly regarded by Norwegian authorities, and Norway is eager to see the collaboration continue. To tackle future challenge, the industry needs to continue investing in technology and research», the Consul General said. Finep is working directly with the Research Council of Norway, and in his welcoming words to the conference, Maurício Syrio listed results accomplished so far. «It is nice to see how our partnership is growing and expanding into new areas like aquaculture and renewable energy. Next year we plan to launch two new joint calls, one within oil and gas research and another call in renewable energy», Mr. Syrio said. General Director William Christensen of the Norwegian Ministry of Petroleum and Energy presented the perspective of Norwegian authorities to the conference. General Director William Christensen of the Norwegian Ministry of Petroleum and Energy. «We are proud of what we have achieved, but today, energy transformation is a subject and we are facing changes and need to find the right balance between meeting future energy demands and the need to reduce emissions», he said. Mr. Christensen focused on cooperation as a key ingredient for Norway´s successful experience, and outlined the strategy for research collaboration in the Norwegian oil industry, called OG21. «There are long traditions for collaboration and knowledge transfer in Norway, between authorities and industry and also between industries. There are synergies and the Hyvind offshore wind park is an example. Going forward, reducing emissions is vital, and this is why dedicated efforts within R&D is so important. 60 percent of the projects that have received support from the Research Council of Norway will contribute to reducing emissions, according to a report. Norway and Brazil are now facing a common challenge as major oil producers and signatory countries to the Paris Agreement», Mr. Christensen said. Keynote speaker of the morning session on the first day was Taran Thune, Professor TIK Center for Technology, Innovation and Culture at the University of Oslo. Ms. Thune is the Project Manager of a project on the supplier industry and value creation, a project executed in collaboration between the University of Oslo, University of Stavanger, Universidade Candido Mendes and Aker Solutions. The main goal of the project is to generate new knowledge about innovation and industrial transformations in the upstream petroleum sector. Taran Thune is Professor TIK Center for Technology, Innovation and Culture at the University of Oslo. Other drivers that contribute to increased innovation are natural conditions like the maturing of the Norwegian Continental shelf, requiring investments in R&D and advanced technologies tailored to new demand conditions, and increased cost and risk that has resulted in the use of collaborative models. Actor constellations and institutional conditions are also important, and the development of the Norwegian Continental shelf is seen as an example of industrial policies, with a number of policy tools. System oriented policies are necessary to foster innovation on a broad scale, Ms. Thune argued. «The petroleum and supply and service industries are leading compared to other industries in Norway. The Norwegian oil and gas sector is indeed an innovative sector, a connected sector and a dynamic sector. What about future transformations? The industry has shown ability to adapt to cyclical crises, but what about need for structural changes going forward. This is a much more troubling prospect», Taran Thune said. 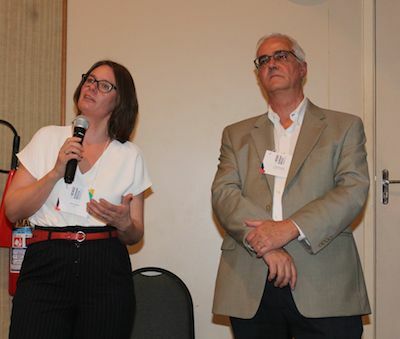 Ms. Taran Thune and Mr. Antônio Botelho answering questions from the audience. Professor Antônio Botelho from Universidade Candido Mendes then shared Brazilian experiences on the same topic: In Brazil, Petrobras traditionally concentrated R,D&I efforts, but times are changing, with more diversification of the innovation systems. Professor from the Norwegian University of Science and Technology, Mr. Johan E. Hustad, gave a video presentation called «Energy research and innovation in Norway». He highlighted subsea technology innovation as a Norwegian example of success, innovation that has made offshore floating wind possible, and talked about the current focus on environmentally friendly energy, different programs at universities and research institutions and listed available funding and incentives. Aly Brandenburg of Shell Brazil. Digitalization, decarbonization and decentralization are mega-trends shaping the energy landscape, according to the presentation. Aly Brandenburg of Shell Brazil provided the audience with a Brazilian industrial perspective, as she presented the Shell R&D program in Brazil. Before lunch on Day 1, Professor Ivan Oliveira from CBPF also talked about how quantum technology can be applied to oil research. The second half of day 1 and day 2 of the conference were organized as parallel workshops sessions on a variety of topics like exploration and geosciences, materials technology, digitalization and automation, subsea field development, environment and improved oil recovery and flow assurance. 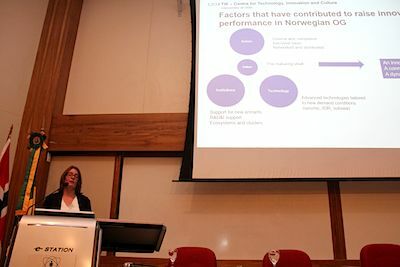 Experts from both countries, representing a variety of universities and research institutions, gave high level presentations on the topics chosen due to their relevance for the Norwegian and Brazilian offshore related research communities. 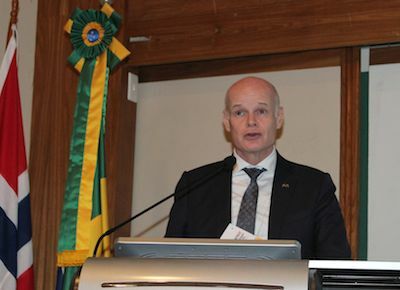 The 6th November Conference was part of the Norway Brazil Weeks 2018, with a variety of events talking place in Rio de Janeiro and São Paulo.